Polybutylene piping | Robins Plumbing, Inc.
Polybutylene isn’t just hard to spell. Have you ever heard of polybutylene piping? It is unlikely unless you have recently gone to purchase or sell a home and discovered with a home inspection that the home had polybutylene pipe. If you have a home that has this piping, or are considering purchasing a home that has polybutylene piping there are some things you should be aware of. First and foremost, this pipe will leak. There is just no way around it, this pipe has been illegal to use in the United states for over 2 decades. I want you to take this information very seriously. I have seen hundreds of floods in my career and they are not fun to go through. A pipe leak in a wall or attic while you’re at work can lead to devastating flood damage. Try having that same leak happen while you escape the Phoenix heat with a weekend getaway. You could come home to an indoor pool and not a house. The flood damage from a leak above ground often leads to complete renovation and homeowners living out of hotels for several months, not to mention the possessions you own being destroyed. 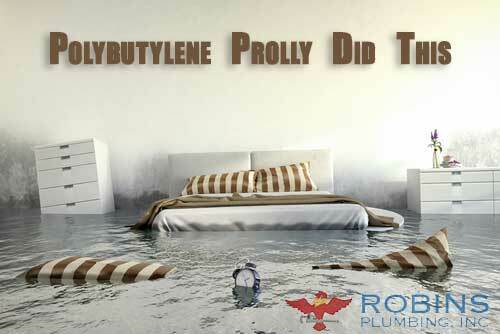 Most of us, including me, never think that a flood could happen to us, but with Polybutylene piping in your home you’re increasing your chances of a flood in a major way. It isn’t a matter of if the pipe will leak, it is simply a matter of when and will you be home when it happens to shut the water off quickly enough to avoid major damage. That’s right. While I was writing this blog to warn people like you of what a polybutylene leak can do, a client of ours flooded. Back in August of 2017 we went out to a water leak for one of our regular property management clients. The leak in August was on a polybutylene line in the wall for a rental property. After alleviating the emergency and restoring water by repairing the water line we advised our client that the house should absolutely be repiped to replace all of the water lines to prevent a flood in the future. You guessed it, this Friday night, March 2, 2018 we got the call. “My homeowner is going to regret not listening to your recommendation to repipe the home, it flooded and we have another leak.” We went out for an emergency leak that occurred in the ceiling while the tenants were at work. The restoration company was on site when we got there drying out walls and tearing them open to replace all the wet drywall to prevent mold. I don’t want this to happen to you. This homeowner now has to fight with their insurance company to get all of the flood damage covered and the hotel for his tenant covered, and it is a fight, because he knew he had polybutylene pipe and ignored the recommendation to replace the pipe. A preexisting plumbing condition can be grounds for an insurance company to deny a flood claim. Polybutylene pipe, though illegal in the United States for two decades is still an issue in the Phoenix area. There are several neighborhoods in the Phoenix area that still have polybutylene piping including Glendale, Peoria, Scottsdale, Tempe and Ahwatukee. 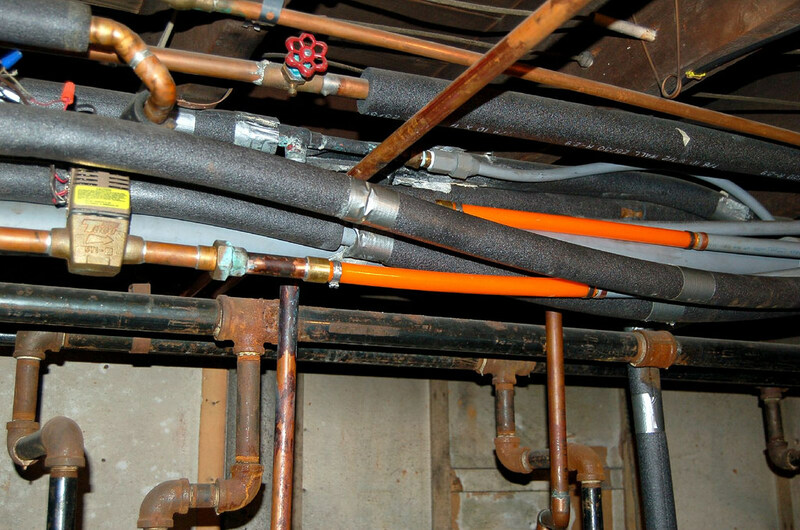 Polybutylene piping is a ticking time bomb that you want to diffuse as quickly as possible. Polybutylene is a polyolefin or saturated polymer with the chemical formula (C4H8)n. This pipe was used for domestic water lines in Arizona from 1978 to 1995. The polybutylene that we will call poly because I am tired of looking to make sure I spelled it right, was projected and promoted as the pipe of the future because of its low cost and ease of installation. During the years it was produced, it replaced traditional copper piping for both exterior and interior plumbing use in residential neighborhoods across the United States. 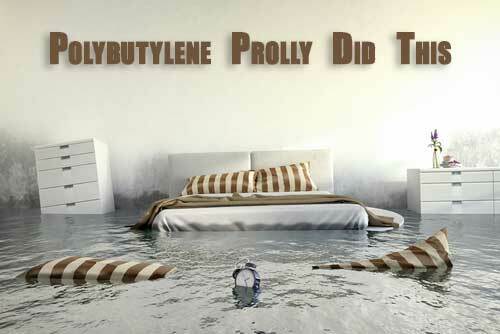 In 1995 polybutylene manufacturers were part of a class action lawsuit that became a settlement of $1,000,000,000.00 to cover damages caused by poly pipe leaking in homes and causing flood damage to properties all across the country. That is a lot of commas! This settlement has since passed its expiration date, but poly pipe is still prominent in parts of Maricopa County including Ahwatukee and NW Peoria. I was in the plumbing profession back when homes were being repiped for the class action lawsuit. Unfortunately many homeowners weren’t aware that they had poly pipe or that it could be replaced at the cost of the manufacturer. Still, many current homeowners are unaware that they have poly piping or are choosing to patch leaks on a regular basis rather than replace all of the poly piping in their homes. Because the chemical reaction of the water with the pipe occurs inside the pipe, it is often difficult to assess the extent of deterioration. The problem can cause both slow leaks and pipe bursting without any previous warning or indication. The only long-term solution is to completely replace the polybutylene plumbing throughout the entire home. A complete repipe of your home is when all of the existing water lines are replaced. This includes all of the water lines to your kitchen, your bathrooms, your water heater, laundry room and to your outside hose bibbs. This also typically includes replacing all of the shut off valves, angle stops and supply lines to your fixtures. That is a lot of plumbing. There is no way to access all of your water lines without opening drywall, so be prepared for some drywall repairs and painting when the project is finished. A repipe project takes several technicians and several days. We recommend to our clients getting a hotel or staying with friends for the week during their repipe. It can be challenging to live in a home during a massive undertaking like a repipe. There is plastic everywhere and your house can resemble swiss cheese. It isn’t necessary to live somewhere else during that week if we do your repipe because we make all necessary connections before leaving at night to ensure you have a bathroom that is usable but if you can get away, by all means I highly recommend making a vacation of the experience rather than living through the construction process. I also recommend having someone scheduled immediately after to get all of the drywall repaired and painted. With crews coming back to back your house will be put back in order rather quickly and the pain of the experience will be a distant memory, leaving you with the peace of mind that you can go to work without flooding and go on vacation without flooding. With thousands of repipes under our belt, you can be assured that the qualified and professional team at Robins Plumbing will replace your polybutylene piping with a quality alternative that will last for years to come. Whether you’re looking for a plastic alternative that is tried and tested for the water quality of the Phoenix area or you want to stick with copper, Robins Plumbing can advise you on your options and provide you a competitive and affordable bid that could ultimately save you from thousands of dollars in property damage.